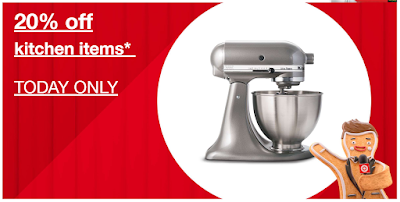 Target is offering an Extra 20% Off select Kitchen Items November 21st only! Plus don't forget you get FREE Shipping and an Extra 5% Off when you use your Target RedCard! Save 20% on select kitchen items. Discount applied at Checkout. Offer excludes Vitamix. Discount not applicable to gift wrap, tax, or shipping and handling charges. May not be applied to previous orders. Offer expires 11/21/2016 at 11:59 PM PT. Browse around for your favorites, before they disappear.